Chicken Fajitas made with homemade fajita seasoning, chicken thighs, bell peppers and onions in a cast iron skillet. Restaurant quality fajitas in just 30 minutes! We love easy everyday Mexican Food recipes like Best Homemade Enchilada Sauce, Beef Barbacoa, Carne Asada and Shrimp Tacos because they’re so much better than the takeout options and they’re so quick to make. Chicken fajitas are one of our go to weeknight meals because they’re easy to make in just thirty minutes and they’re a good way of getting kids to eat a lot of vegetables. We also like to mix the recipe up and serve it with non traditional options for a more Tex-Mex feel (like with Queso dip – this combination is amazing). In addition to this recipe working well with chicken breasts, you can also use lean steak, pork loin or any seafood you’d like. The fajita seasoning and the vegetables work great with all proteins, my favorite being shrimp fajitas. 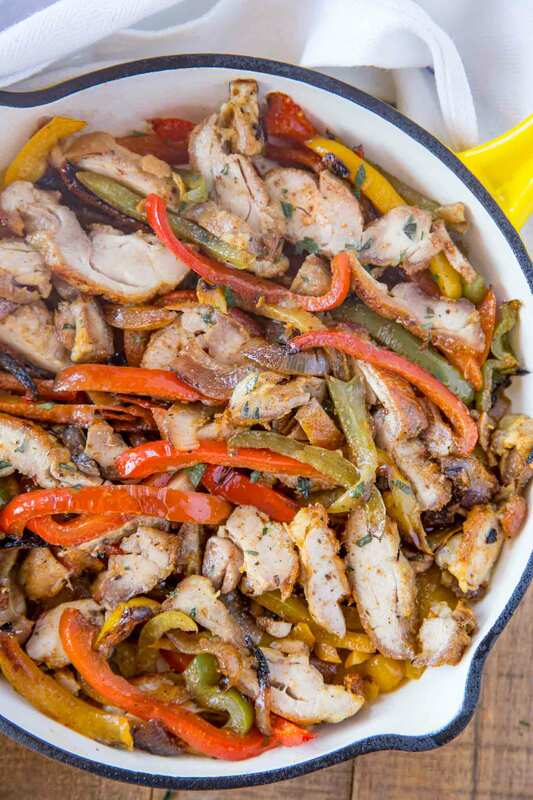 The best way to cook chicken fajitas is on high heat in a grill pan like or a griddle. The higher the heat the better the sear on the chicken and the vegetables since we’re cooking them for only a few minutes. If you’d prefer to use a pan for a stir-fry style I recommend using a cast iron pan as it will give the best sear and flavors. Since we’re cooking it quickly you can also substitute skinless chicken breasts for the chicken thighs that are in the recipe, but you’ll have to serve them quickly as they will dry out faster than chicken thighs which can sit in a hot griddle through serving with no issues. 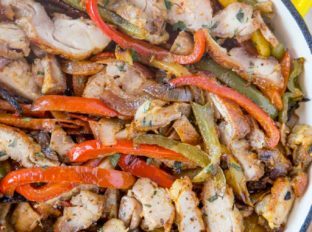 The chicken fajitas can also be grilled, put in a slow cooker or cooked on a sheet pan because the recipe is totally adaptable. If going in the slow cooker use , if being grilled cook over medium high heat and cook the veggie portion in a grill basket. Add all the ingredients tossed in olive oil and the seasonings to a grill basket and cook on on medium high heat for 8-10 minutes until the chicken is cooked and the vegetables are just starting to char. Add the chicken and seasonings to the slow cooker (do not pre-slice the chicken) and cook the chicken for 4 hours on low heat. Slice the chicken, toss with the vegetables and additional seasonings and cook on low an additional two hours. You’d end up with great flavors if you seared it off in a pan before serving but I get that it defeats the purpose of the slow cooker. If cooking on a sheet pan line everything up in as even a layer as possible and roast at 400 degrees for 18-20 minutes. If you crowd the pan too much the food will steam instead of brown at all and it will taste boiled. 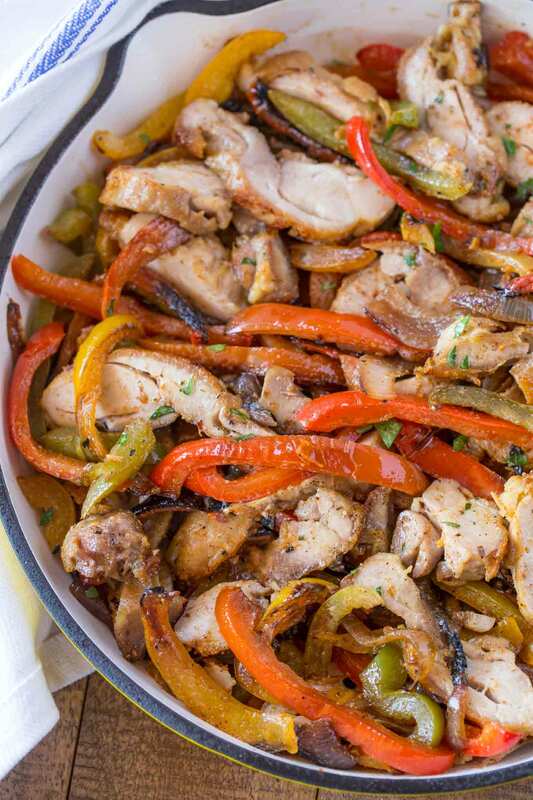 I promise you, these are the best chicken fajitas whether you grill them, slow cook them or bake them off on a sheet pan. 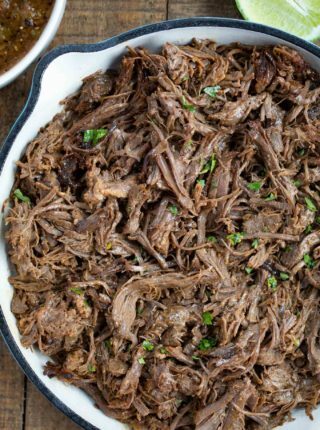 First time you make them, make them in a large skillet as written below and the next time you make them try them on the grill. With summer coming, this recipe is perfect for grilling. Plus if you’re like me, any recipes with a short cook time are a winner when the weather starts warming up! 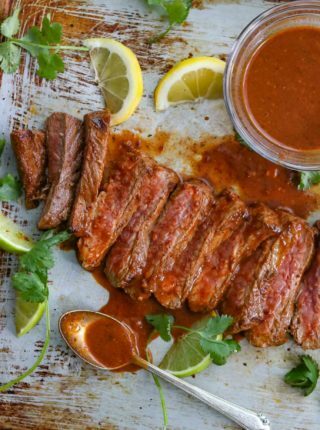 Marinade: We don’t marinate the meat in the recipe but if you did add a marinade or even just added the seasonings to the chicken the night before. Fresh lime juice: this adds a freshness and brightness to the dish along with a ton of flavor. Sour Cream: adds a creamy, cool element the recipe. Guacamole: adds richness and creaminess to the dish and enough flavor to avoid other fats. Cilantro: It isn’t just a garnish, adding chopped cilantro adds a lot of great flavors. Salsa (Pico de Gallo): Fresh salsa is a healthy way to add a lot of extra flavor. 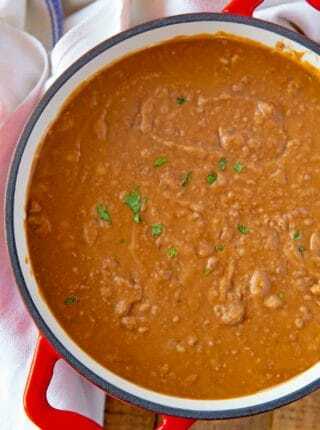 Refried Beans: Homemade refried beans are great for binding a fajita wrap or as a side. Queso: Perfect as a topping/sauce or for a side dish with chips. 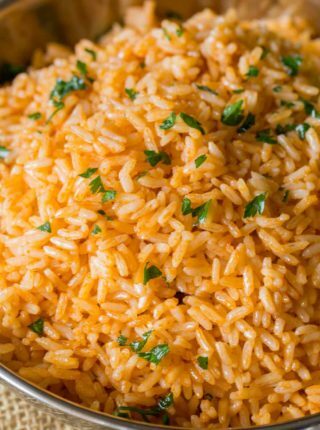 Mexican Rice: The ultimate easy side dish for all Mexican food. With flour tortillas or corn tortillas as originally intended. In hard taco shells topped with lettuce and tomato or even a creamy slaw. With a large salad full of romaine, grape tomatoes, avocados, salsa, and sour cream. In a rice bowl, or over cauliflower rice for a low carb option. Rolled in a warm tortilla with sharp cheddar cheese, sour cream and baked with enchilada sauce. In lettuce cups instead of tortillas. Chopped up leftovers stuffed inside of quesadillas for a perfect, easy leftovers meal. Add half the canola oil to a large cast iron skillet or large skillet on medium high heat. Add the chili powder, kosher salt, paprika, cayenne pepper, cumin and chicken in a small bowl and mix well. Add the chicken to the skillet and cook until crisp on the outside and cooked through on the inside (about 3-4 minutes on each side) then remove from the pan. Add the rest of the canola oil and the onions, bell peppers and garlic to the pan and cook for 4-5 minutes. Slice the chicken, add it back into the pan and squeeze half the lime wedges over the pan before serving. I made this tonight. Just fantastic. I had to stop myself at 3. I told my wife I could finish the pan. Your web site has been a huge blessing to my family. Thank you. That’s so sweet of you to say! I’m so happy to hear that you enjoyed them. Forgive my ignorance but would you add sour cream when cooking this or would you just use it as a topping? I would add it as a topping once cooked. I hope you enjoy it! Okay this looks amazing!! Thank you so much! I love getting fajitas out, but never make them at home. That has got to change. This sounds wonderful and easy! This recipe is really easy so give it a try! Chicken fajitas are my favorite, so I need to try your recipe. It looks super tasty! Thank you so much for sharing! Chicken fajitas are my go to dinner on crazy nights. LOVE this recipe! My mouth is watering – these look so dang good! These fajitas look WAY better than our local restaurant! I can’t wait to try them out! No need to go out for them anymore!